Mobile Money Millionaire is a mobile binary trading app owned by Dean Barber. He promises to make you thousands of dollars a day, but can he be trusted? Is Mobile Money Millionaire a scam? Let’s find out in our Mobile Money Millionaire review. 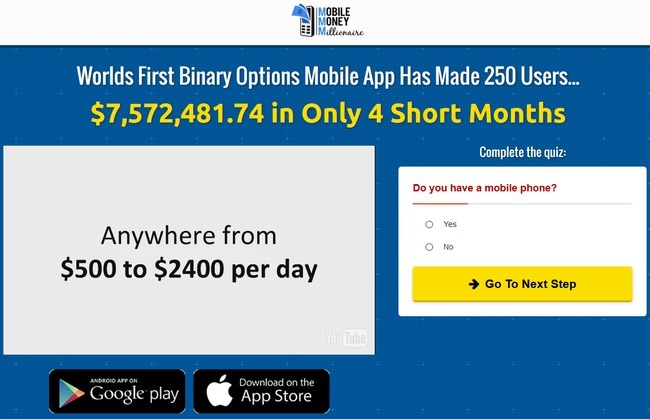 Mobile Money Millionaire scam (yes, it is a scam) by Dean Barber promotes itself as a newbie friendly mobile binary trading app that can generate consistent profits for you. 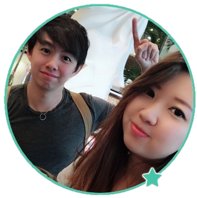 Dean claims that his software, MMM 2.0 Binary Options app analyzes the binary options market with its sophisticated algorithm and tells you what trades to place. You are guaranteed to make anywhere form $500 to $2,400 per day just following the instructions of the app alone. We’ll reveal in a while that Dean is just lying to you, and why you cannot trust him. At the end of his sales video, Dean didn’t forget to promise you sports car, nice residence, and dreamy vacations. He also didn’t forget to promise you that you can quit your job and be your own boss just by using his app. Please don’t fire your boss just yet because Mobile Money Millionaire will not make you richer. In fact, you’ll become poorer by losing all your money in the binary options market. The only man who’ll become richer is Dean Barber, because he’s going to scam your hard-earned money from you. This section is intended for newbies who are not sure what binary trading is all about. If you have experience with binary options market, you may skip this section. Binary options is gaining popularity in the recent years due to its simplicity. It is basically trading stripped down to its simplest form. Unlike stock market and Forex, you don’t have to stay on top of financial news and analyze charts to make a trade. With binary options, you only need to guess if the price of an asset will rise or fall after a short period of time, usually between 30 seconds to minutes. You either win, or you lose (hence the name binary options, or 2 options). This is how it works – let’s say I predict that the exchange rate of EURUSD will rise after 3 minutes, and I bet $50 on a 3-minutes contract. If I’m right, I’ll win a certain percentage of what I bet, usually about 60% ($30). But if I’m wrong, I lose the entire $50 that I bet. You probably realize by now that binary trading is not that different from the average gambling. There’s no good way to predict the market movement in such a short period of time. In most cases, traders rely on pure luck and gut feelings, just like how you would guess the outcome of a coin toss. Even if you manage a decent 50% win rate, you’ll still lose money due to the uneven winning vs losing payout of binary options (winning $30 vs losing $50). We do not recommend binary options if you want to generate serious income from the internet. It’s one of the worst possible ways to make money online. There are simply better alternatives out there that are much more promising than trying to gamble your way to wealth. How Does Mobile Money Millionaire Work? According to Dean Barber, alleged owner of Mobile Money Millionaire system, making money with his app is so easy that any newbie trader or rookie trader can start earning money instantly. You just have to follow the step by step instructions on the app to know exactly what to do and when to do it. The truth is, Mobile Money Millionaire system is just the same as any other binary trading robots out there, minus the automated part. It generates a trading signal for you and decides for you if you should call (betting on a price rise) or put (betting on a price fall) for a trade. If you have researched automated binary options signals before, you’ll know that trading signals generated by bots have a bad reputation. There are literally hundreds of binary options scams out there. Forget about the $500 to $2,400 profits that Dean Barber promised you, as we are going to reveal the truth behind Mobile Money Millionaire scam using their own disclaimers. If you take some time to find and read through the terms and conditions of Mobile Money Millionaire (which no one does), you’ll realize that Dean Barber and Mobile Money Millionaire scam have some dirty secrets they don’t want you to know. Examples in these materials are not to be taken as a promise or guarantee of earnings. Earning potential is entirely dependent on the person using our product, ideas, techniques and the effort put forth. You can forget about the $500 to $2,400 daily profit Dean promised you. Even though Mobile Money Millionaire app is giving you all the trade signals, somehow your earning potential is entirely dependent on your own techniques. Not convinced that Mobile Money Millionaire is a scam yet? Let’s see one more proof from their terms and conditions. No trades were made at all with Mobile Money Millionaire system! Inside the terms and conditions, you’ll find that the earnings presented in their sales materials are not real. This includes the $7,572,481.74 that Mobile Money Millionaire scam claim to have made for their 250 users. NO TRADES have been executed with the Mobile Money Millionaire system. If you think Dean Barber include such terms as a fair warning for you, you are wrong. The only purpose of these terms is to protect themselves from legal actions when you lose all your money using Mobile Money Millionaire system. If they wanted to be upfront, they would’ve warned you against the risks of trading binary options, and that none of the earnings presented are real. But Dean Barber really wants you to use the app, so he can earn money off you. How Mobile Money Millionaire Earns Money Off You? You may wonder why Dean Barber makes so much effort to promote Mobile Money Millionaire system just to give it away for free. If you decide to use Mobile Money Millionaire, you’ll be required to sign up for a trading account with their designated broker in the sales page (which is an affiliate link). Dean and the team behind Mobile Money Millionaire scam will earn a sum of referral fees as soon as you make your first deposit. You need to deposit a minimum of $250 before you can start trading. I was assigned to AAoption broker, but you may get assigned to a different broker depending on your location. You can only use Mobile Money Millionaire app with their designated broker. Even if you already have an account with the same broker, you have to register for a brand new account because the scammers behind Mobile Money Millionaire cannot get their referral fees if you don’t sign up through their affiliate link. Not only that, Mobile Money Millionaire will continue to earn commissions off you over the long term. They get a cut of trading commission for every trade that you make. Regardless of whether you win or lose money, Mobile Money Millionaire will get a profit as long as you are still trading from your account. Is Mobile Money Millionaire a Scam? YES, IT IS A SCAM. As we’ve said in the review earlier, we don’t recommend binary options trading as a way to make money online, at all. It’s basically the same as gambling, and using an automated trading software doesn’t make a difference. You are essentially putting your hopes and entire investment in a piece of software that gambles on your behalf. The Aussie Method is a Scam – Read This Before You Join!